Stealth reincarnation. 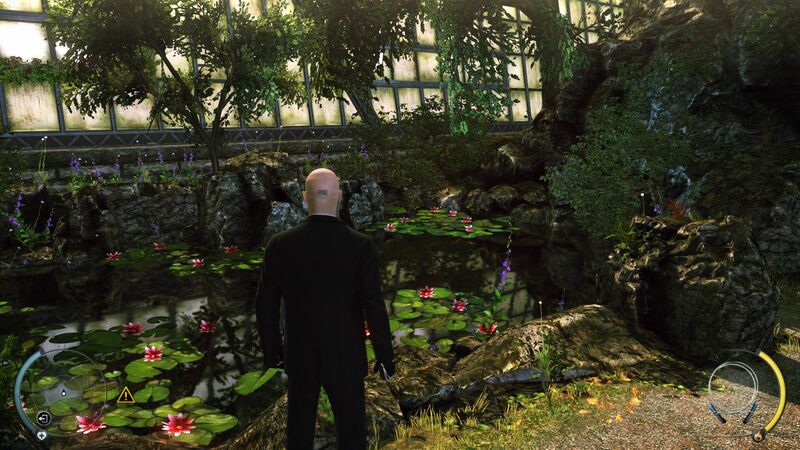 The time-honored Hitman series boldly leaps into the year 2012. 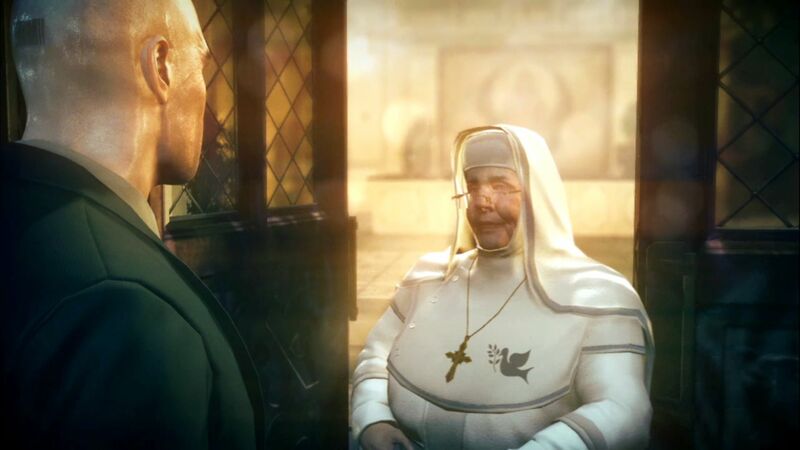 The developer IO Interactive stays true to its principles, presenting with Absolution a classic clandestine adventure that holds to its roots. 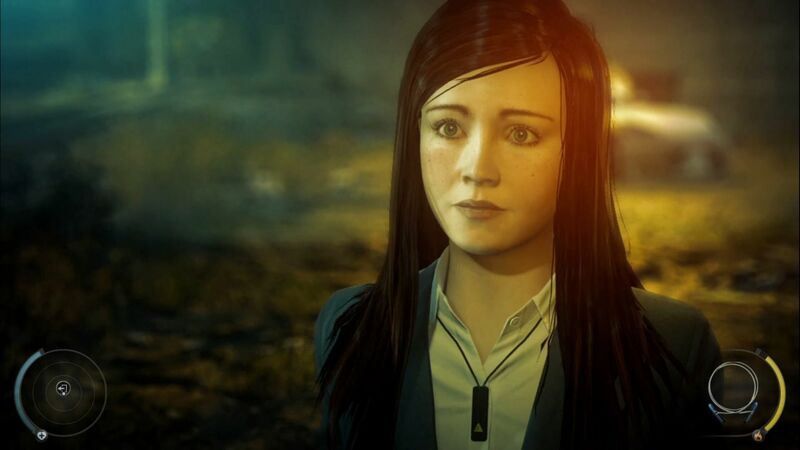 We fought through the first level and investigated how hardware-hungry the game is. If you take a look at Square Enix you'll see the financial crisis hasn't hurt every publisher. The company, previously primarily active in Asia, took over its limping competitor Eidos Interactive in 2009. 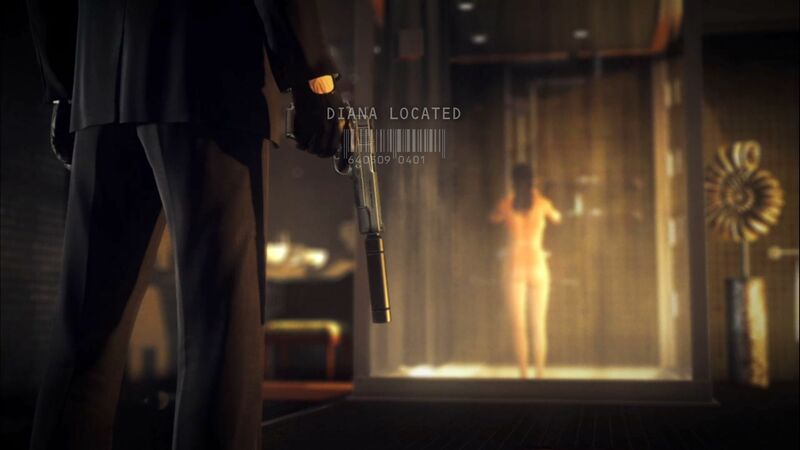 In the process it gained big labels like Tomb Raider, Deus Ex, Thief and Hitman. 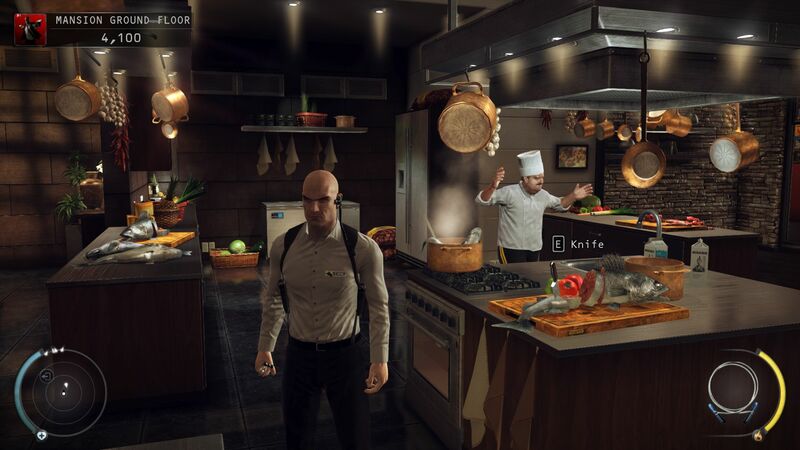 After the Hitman developer IO Interactive hazarded an excursion into the action genre with the Kane & Lynch game and its sequel in 2007 and 2010, the Danes are once again concentrating on their real strength: stealth. 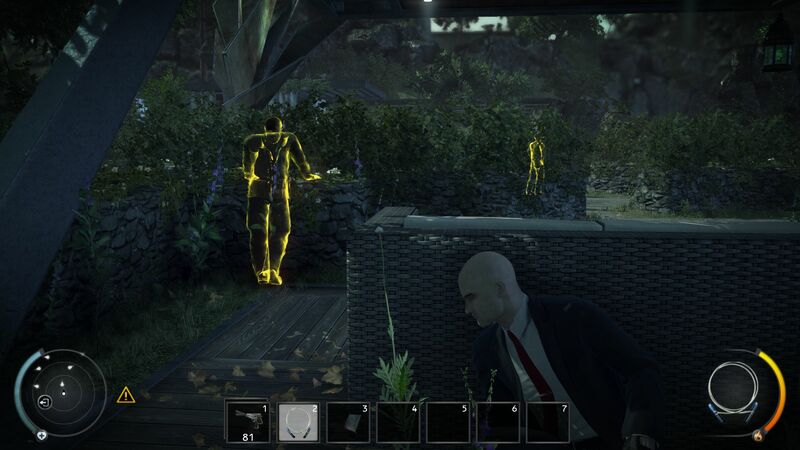 Strictly speaking Hitman isn't 100% stealth. 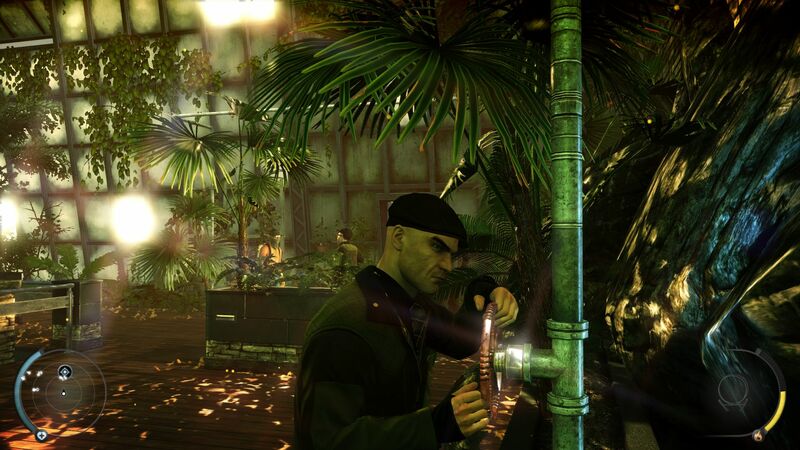 While Thief and Splinter Cell primarily entail light-and-shadow play, the Hitman series involves considerably more variation, surpassing what normally comes under the term "stealth". Thus in Absolution we not only skillfully use our environment, but the power of illusion serves us as well. Guises play an essential role here. 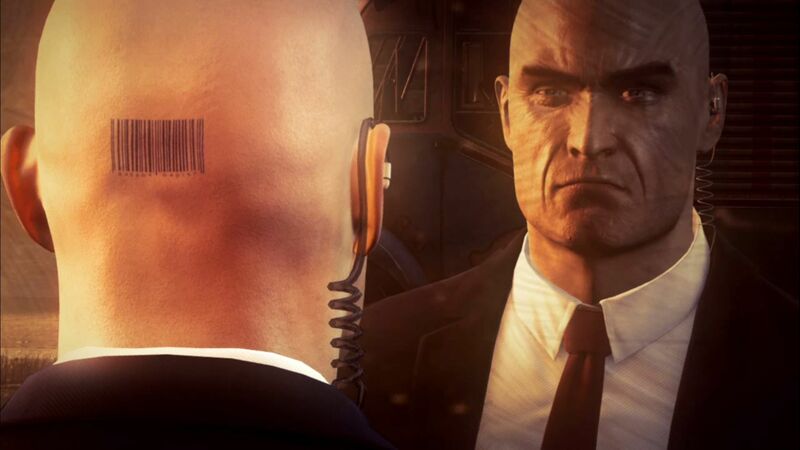 May I introduce: 47, Agent 47. 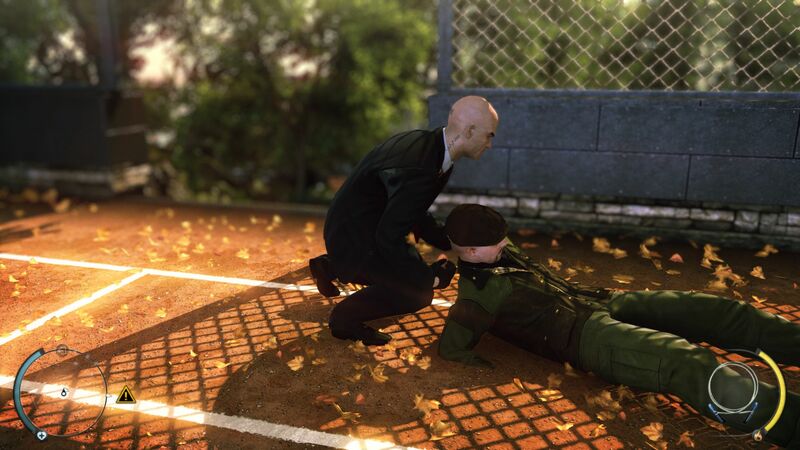 We deem the introduction to the new Hitman narrative a complete success. As Absolution starts off, the main character (a genetically enhanced clone) must eliminate his old employer, Diana. Why? Well, supposedly the woman compromised the company's own network and had all the agents busted. The bald man in a suit accepts the proposition, and makes his way over to Diana's safe-house. 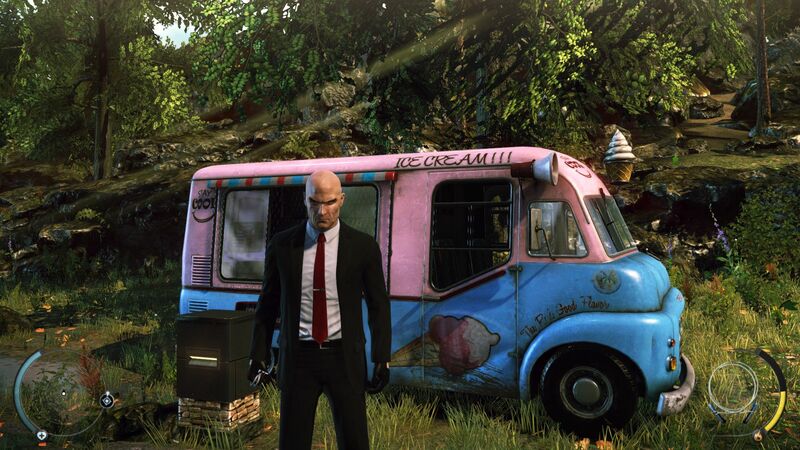 Only seconds into the game we have to smile to ourselves: instead of driving up in a dark limousine (or something of that nature), Hitman shows up in a brightly-colored ice cream truck (see image). Absolution uses the first mission as an extensive tutorial. In the garden of the sophisticated property, not only do we learn the general controls, but we are also acquainted with some of the finer points. Among the most vital is the new covering system. 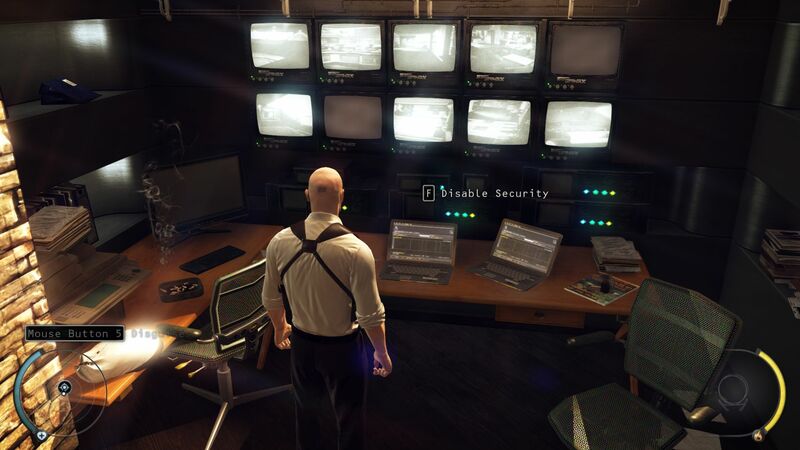 With a click of the space bar Agent 47 huddles himself against numerous objects, like bushes, walls or crates. Great: if two objects are directly next to each other, you can use a key to switch your covering at lightning speed. We come in peace! Or not? A good covering is the A and O. Of course bodies can be transported. You can take an opponent as a human shield. The rich detail is phenomenal. 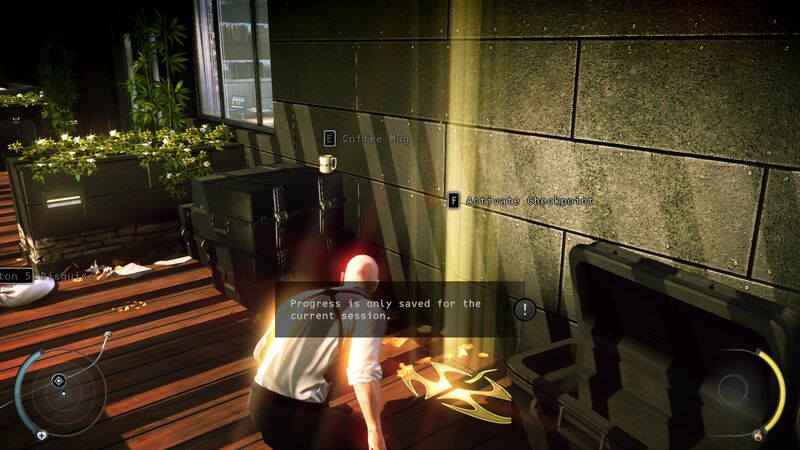 If you don't feel like sneaking around, you can also shoot your way through the compact levels with your gun drawn - but the real fun in Absolution can only be experienced if you operate in hiding and meticulously analyzing your surroundings. 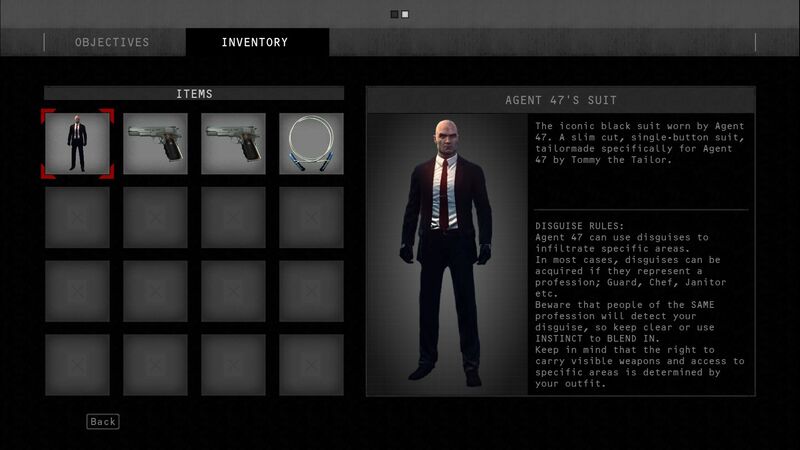 IO Interactive gives the gamer all sorts of options to have on hand. Example: crouched, we approach a guard and eliminate him with the famous piano string. 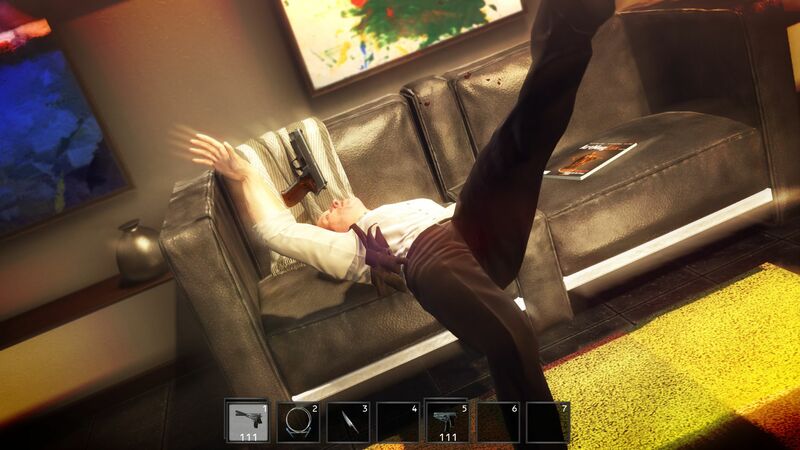 So that his patrolling associates don't suspect anything, we seize the body on the spot and drag it out of reach. 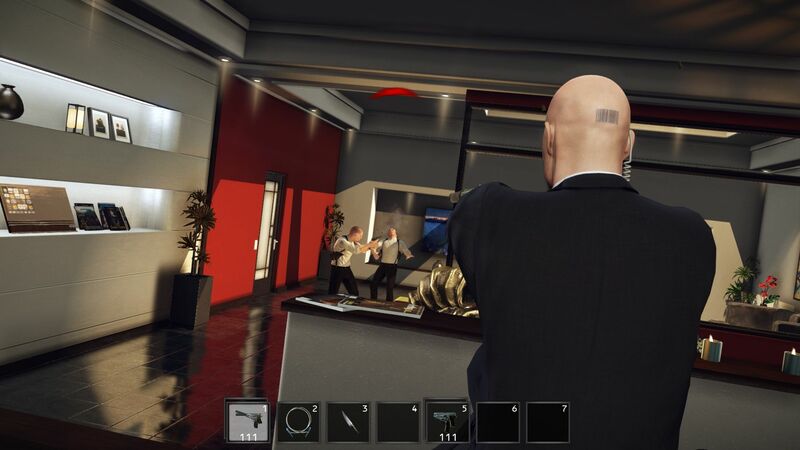 As soon as we feel we're unobserved, we make Agent 47 switch out his clothing. As an "imitation guard" we can move much more freely and observe our opponents at close range. But be careful: opponents wearing the same outfit will see through our masquerade sooner or later, so we ought not to dance forever in front of the guards' noses. The danger of being recognized varies based on the level of difficulty. Pros can ignore the visual assistance. It's easier to play with disguises. There are many ways to dispose of bodies. 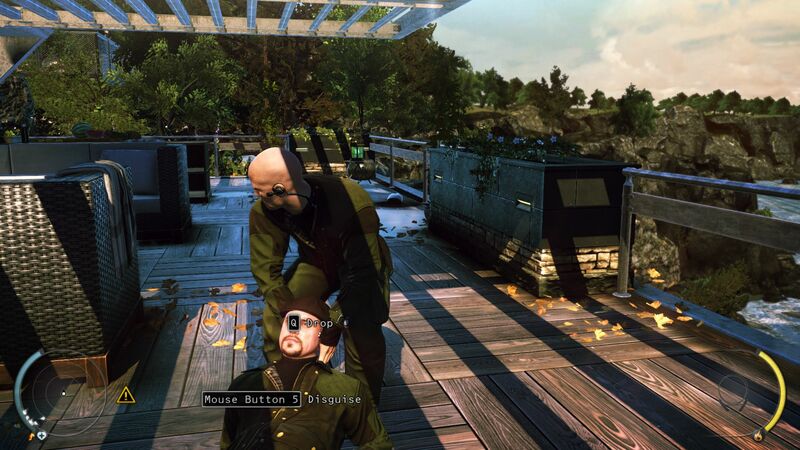 Absolution offers a variety of diversionary tactics. Who'd a thunk? 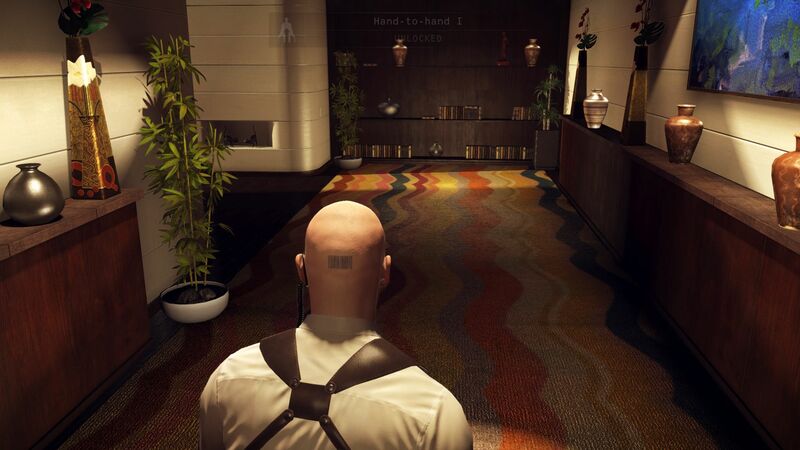 The Hitman is even free of vertigo. That was probably the last day of work. On the topic of variety: the level of difficulty also influences other factors, like the number of opponents, the save-system (the game saves at points spread throughout the level) and the instinct mode. Wait a moment, what exactly is this so-called "instinct mode"? Well, it's a visual assistant that marks interesting objects, highlights opponents and their routes (even through walls) and better protects our cover. On the lowest level the instinct practically guides you through the whole thing. Whether the mode should be considered "cheating" is something each player can decide for themselves. We personally find it very useful. 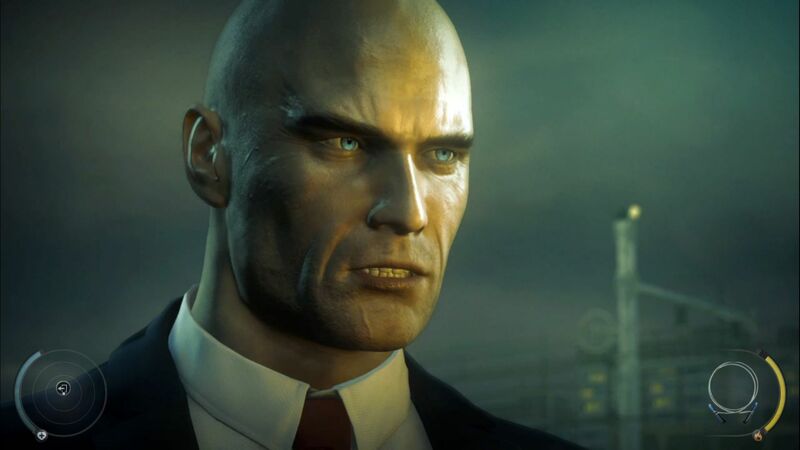 Agent 47 of course also manages without artificial improvements. As our screenshots show, you can distract opponents, poison them, stow them away in boxes or closets, pull them out of windows and throw them over railings. Happy "accidents" cause the gamer-heart to leap especially high. Annoying: we can only save at predetermined points. 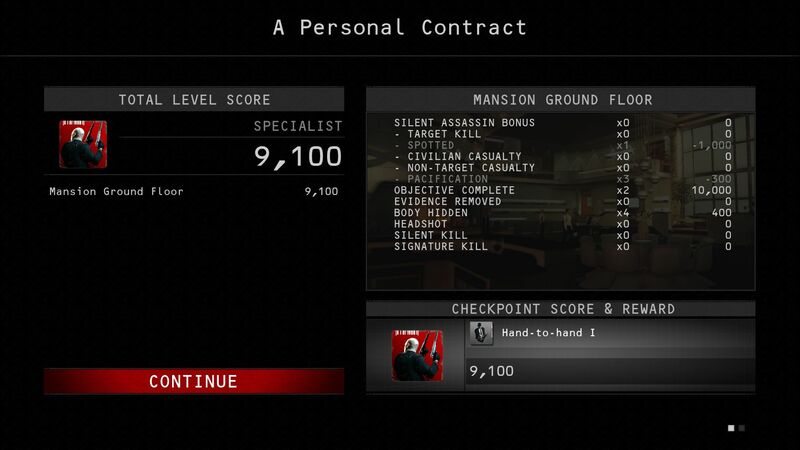 Of course the Agent wants to operate in secret. In some zones you should wear specific clothing. Our favorite activity: creative clean up. The little duck near the bath is an homage to the predecessors. 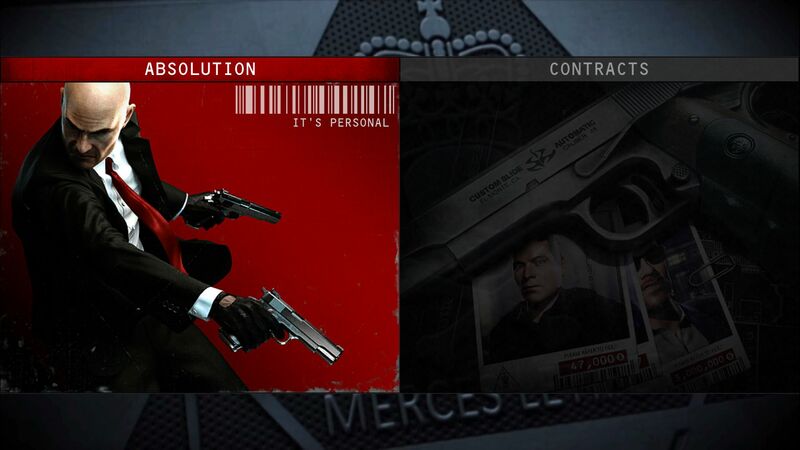 Nice idea: Absolution compares its own performance with the competition. 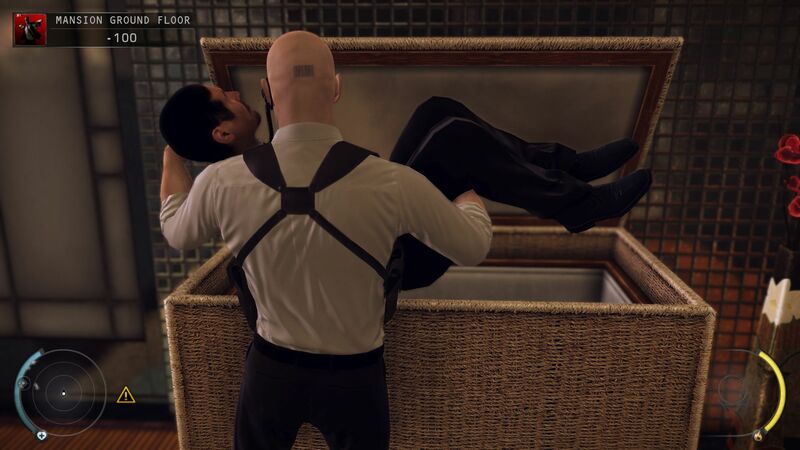 It's a shame that IO Interactive overloaded the controls a little bit. For the actions "take", "carry" and "use" there are three different keys. In this author's opinion, there's room for improvement here. In general Absolution is controlled rather slowly, which is actually desired. 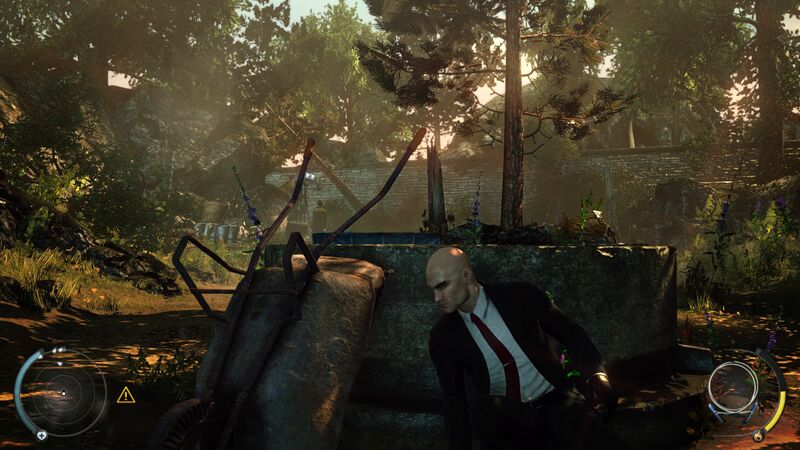 In comparison to Corvo from Dishonored, Agent 47 acts like a lame duck. 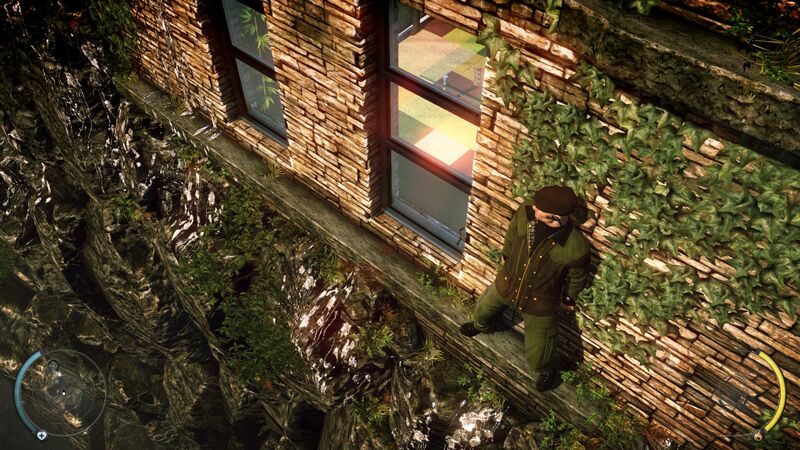 The game-tempo is more like that of Splinter Cell and Thief. Further criticism: the visibility indicators are rather poor. The attentiveness of adversaries is sometimes difficult to assess. However, it is impossible to find fault with the sound. The professional speakers and the awesome music bring us deep into the world and the story. In combination with the affectionately designed areas, we find ourselves in an almost unsurpassable atmosphere of suspense. Anyone who moves forward in the missions quietly and thoughtfully will be rewarded at the end of the assignment with good statistics. 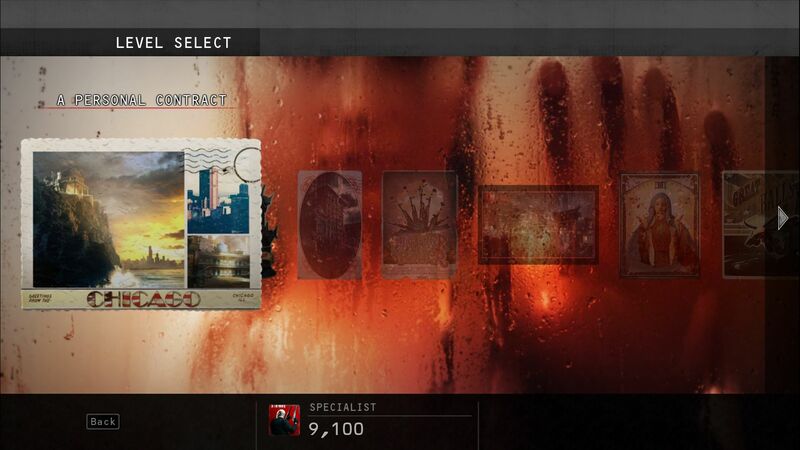 Thanks to the many secrets, achievements and activatable extras, Absolution offers enormous replay value. 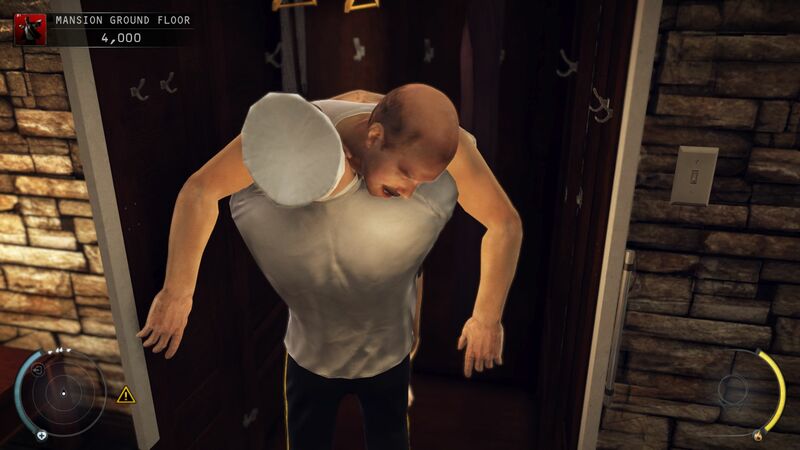 The poor cook makes us feel sorry for him. ...then he's deposited in the cupboard. 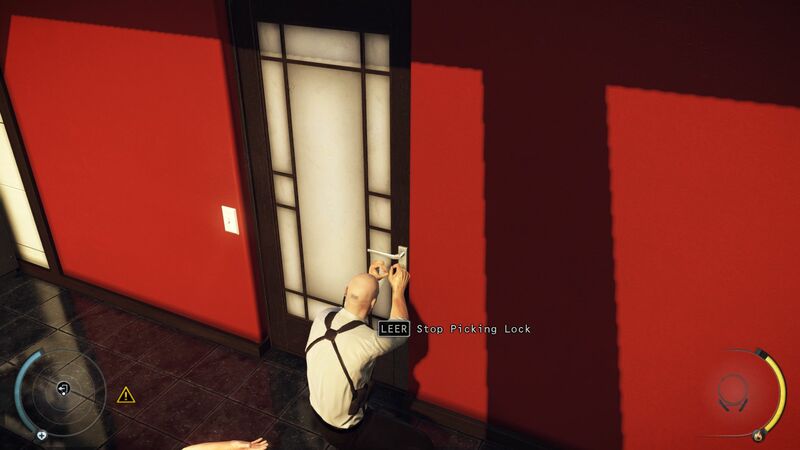 Breaking into locks is part of our standard repertoire. ...which upon being shot sail spectacularly through the area. 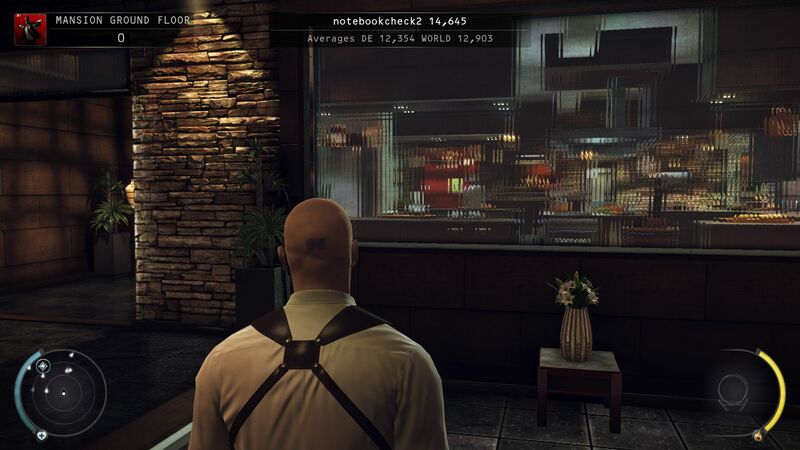 We have to give IO Interactive high praise for the integrated benchmark. The sequence, lasting about a minute, shows a lively party under a wide-open sky with tons of fireworks and passers-by. Due to the large number of people emerging from every direction, the passage turns out to demand a fair amount of processing power. Depending on the level and the environment, the performance in a one-player game can be sometimes better, sometimes worse. Since we're talking about a pretty slow-moving third-person game, about 25 fps on average will do. 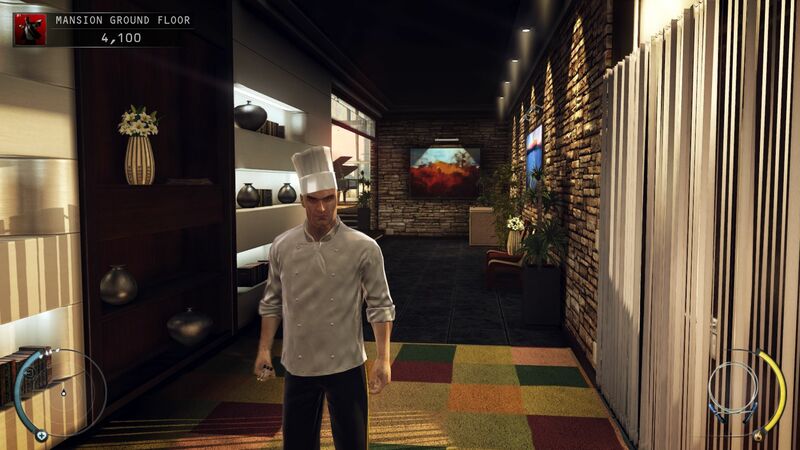 The Glacier 2 engine, developed by IO Interactive itself, provides exceptional picture-quality. That kind of sharp texture and high-class effects is hard to come by. 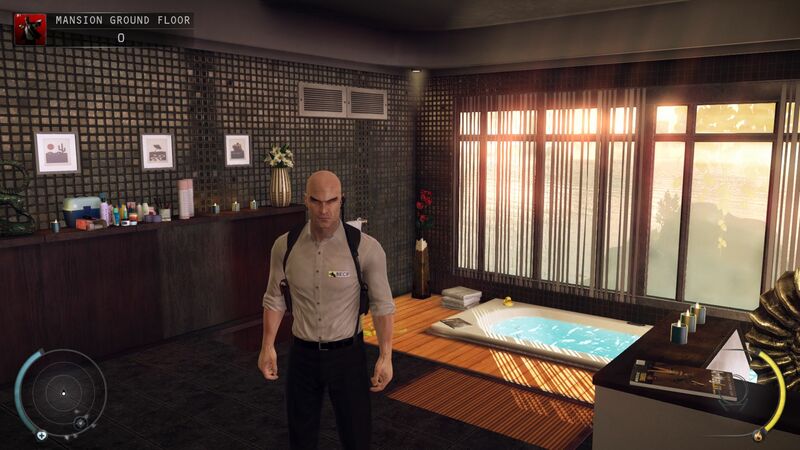 In particular, the lighting (which can admittedly be a little exaggerated) leaves Agent 47 paused in wonder. 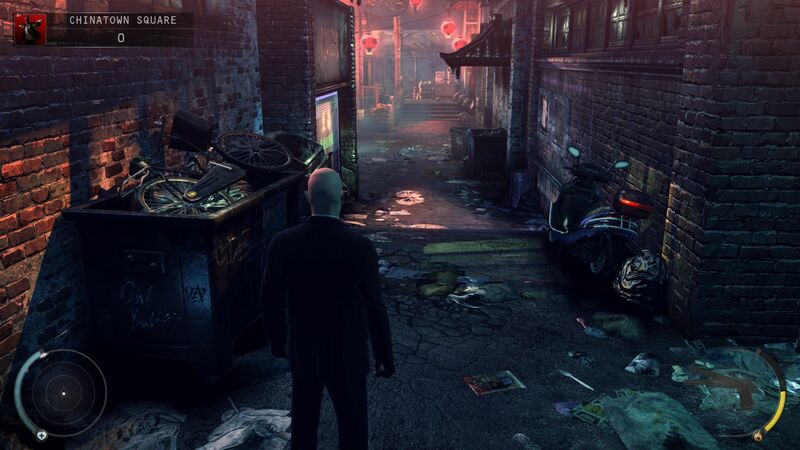 In our opinion the visuals are even beyond the level of Max Payne 3. 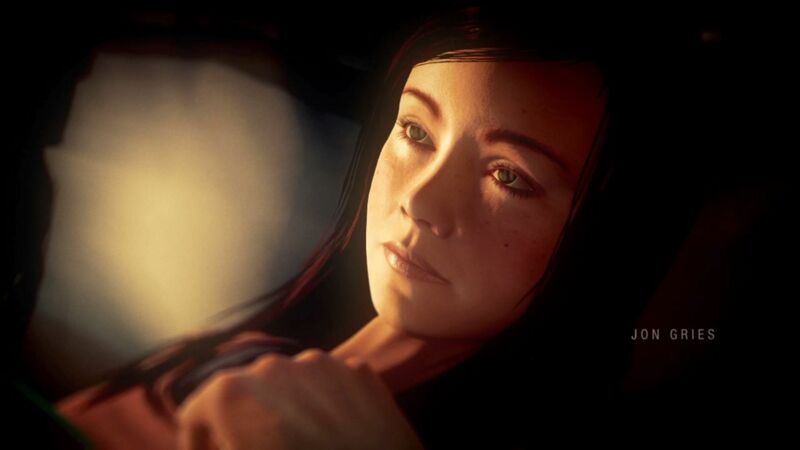 Or put another way: Absolution is one of the most beautiful titles of the year. As one would expect, the graphic opulence is accompanied by above-average hardware demands. 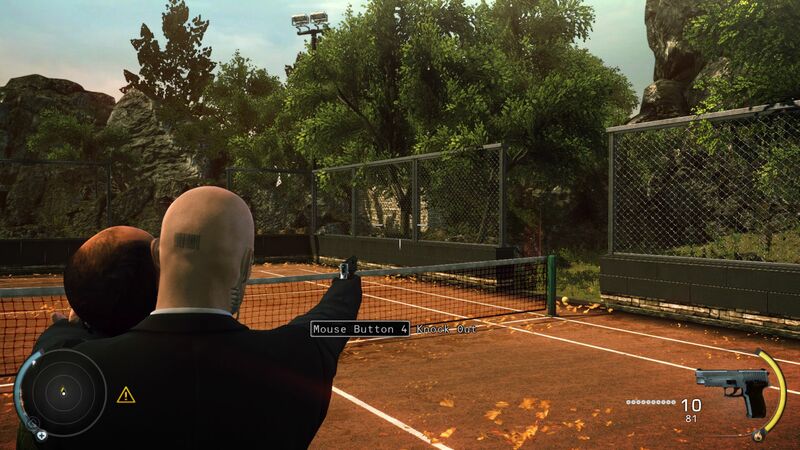 IO Interactive put a lot of work into the setting options. That means that among other things, we can control the resolution, the refresh rate, the display mode and (on compatible systems) the 3D display. 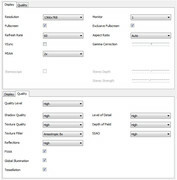 Most of the options can be found under the "Quality" tab. 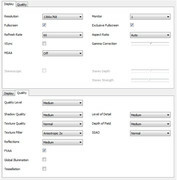 The developer filled a whole 11 option selections under this category. Anisotropic texture-filtering, tessellation, global illumination and SSAO are only a few of the many features. 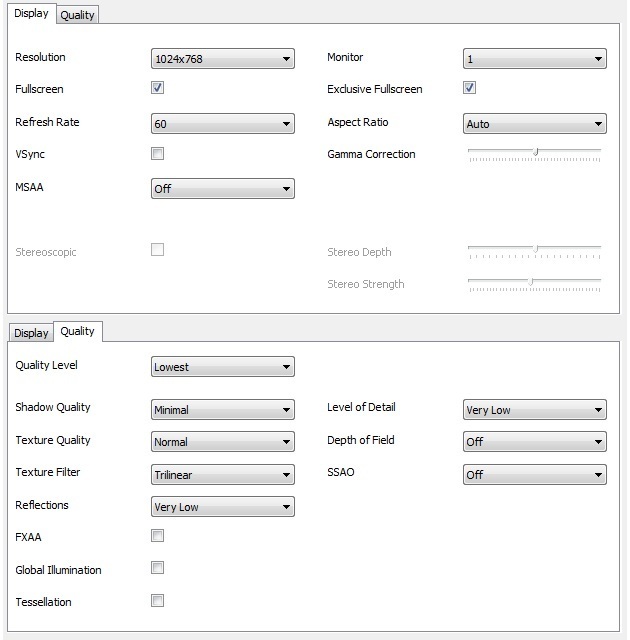 For anti-aliasing, both MSAA and shader-based FXAA are offered. For our benchmarks we're sticking to the four presets, "Ultra", "High", "Medium" and "Lowest". 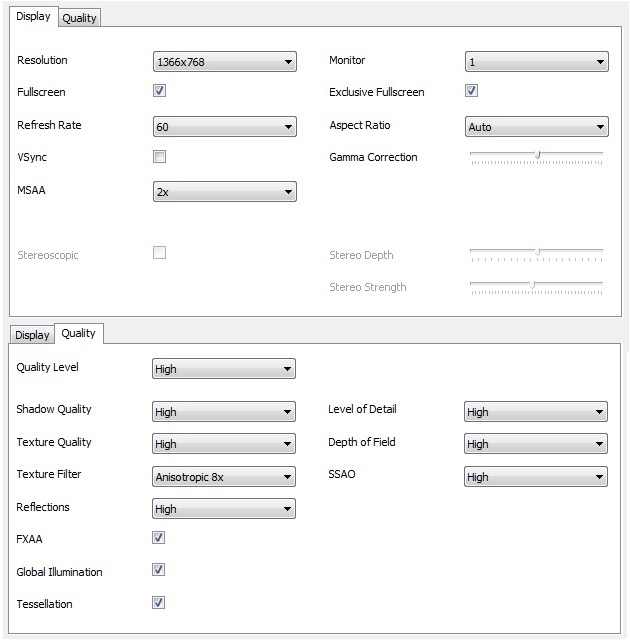 Excellent: the graphics options can be adjusted both inside and outside the game. Nvidia graphics cards may tend to perform poorly due to the fact that Absolution belongs to AMD's "Gaming Evolved" program. The same phenomenon occurred with Sleeping Dogs, also released in 2012. Nvidia countered with the "the way it's meant to be played" program. Assassin's Creed III is an ideal counterexample. 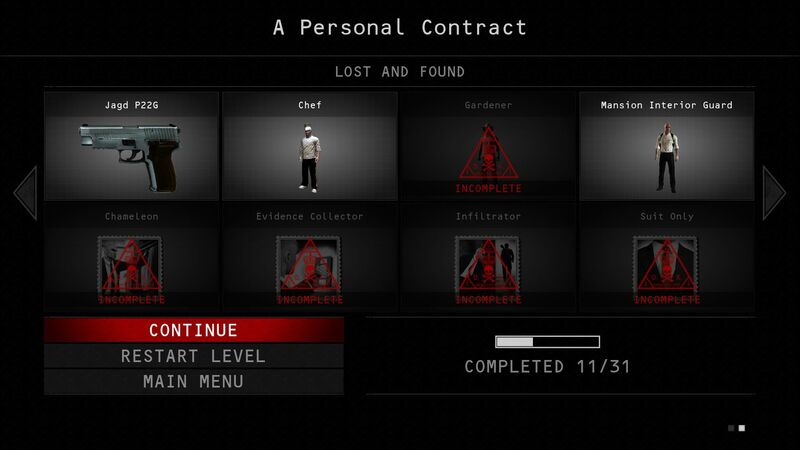 Contracts make possible the creation of individual assignments. There are 20 levels in total. True Hitmen only need the piano string. The missions' descriptions are accompanied by music. Absolution keeps track of our activities very precisely. The extras keep the level of motivation high. Using 1920x1080 pixels, quadruple MSAA anti-aliasing and the "Ultra" preset, most devices have to give up without much ado. 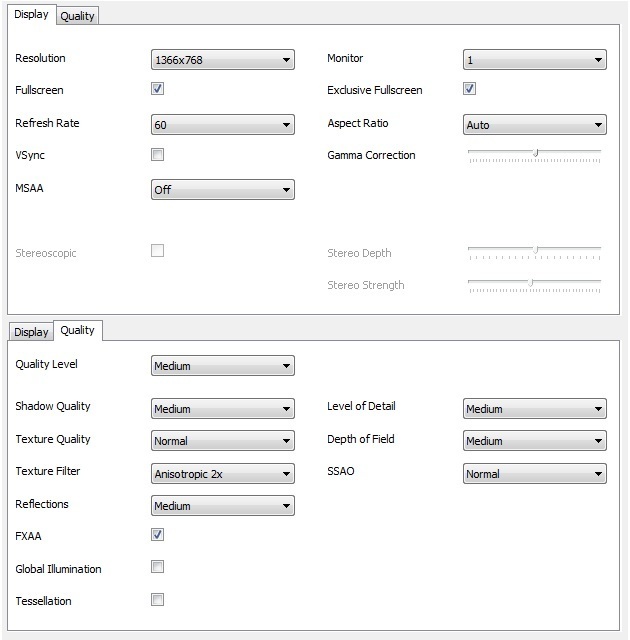 Only the Radeon HD 7970M and the GeForce GTX 680M more or less manage these settings on the monitor. To play with high detail, double anti-aliasing and 1366x768 pixels there should be at least a GeForce GT 650M or GTX 660M in the notebook. Cheaper, all-round notebooks containing a mid-range GPU on the level of the GeForce GT 630M will only be able to manage the middle preset at best. Processor chips like the Radeon HD 7660G or the HD Graphics 4000 already have trouble at the lowest preset and 1024x768 pixels. The old Sandy Bridge model HD Graphics 3000 unfortunately can do naught but surrender. 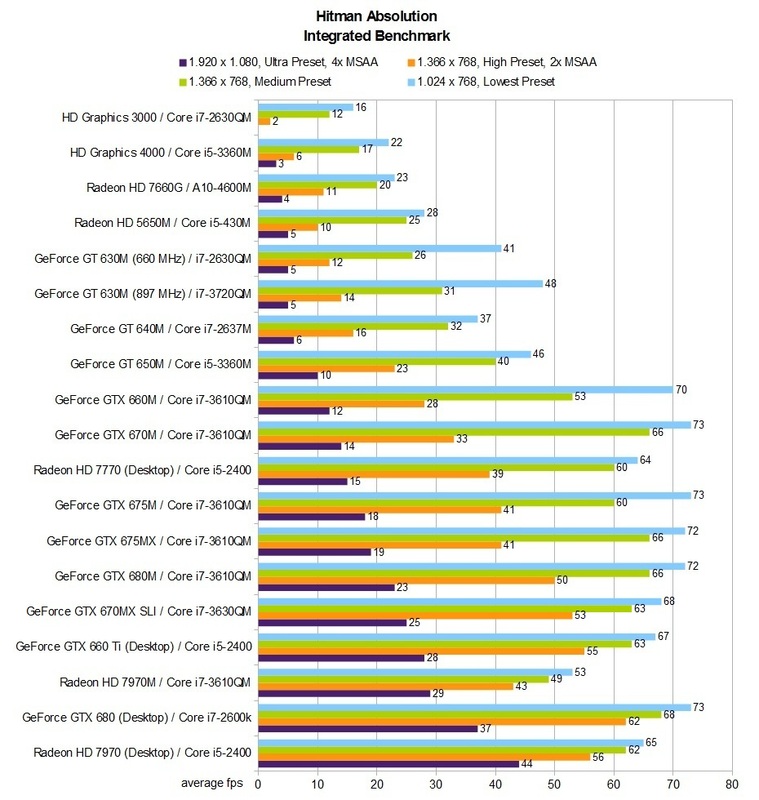 Note: at the lower and middle settings, the CPU is often the limiting factor. 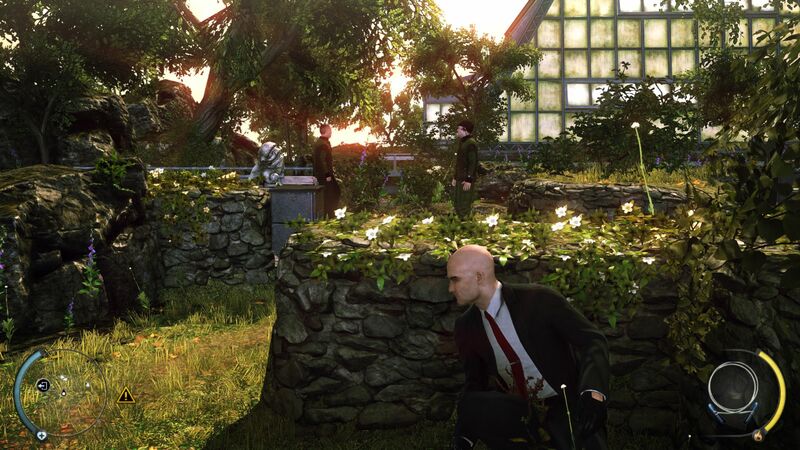 Those who cherish stealth-gaming should absolutely give Hitman: Absolution a closer look. The hours of puzzling over optimal strategies and plotting the perfect murder make it easy to forget reality. The developers prove that stealth games can be simultaneously modern (graphics) and classic (gameplay). If it had a nicer save-system and crisper controls we would have liked it even better. Even so, we count Absolution one of the highlights of the year. Does he always have to look so grim? The killer isn't totally unsympathetic. The story is certainly an exciting one. The GPUs below used the following drivers: Nvidia 310.61 Beta, AMD 12.11 Beta 8 & Intel 9.17.10.2875.